Changes and updates are gradually being made, as well as some fine-tuning here-n-there. We appreciate your continued patience as changes are made. In the early years, Holy Family was exclusively served for a short time by priests from the late-Archbishop Marcel Lefebvre’s Society of St. Pius X (“SSPX”), or by priests affiliated with the SSPX. When the Society decided to no longer serve the faithful in South Carolina, the members sought-out independent and validly ordained priests who were willing to travel and continue offering Mass and providing the Sacraments, until a full-time priest could be found. In late-February 2008, this new, full-time priest came to Holy Family in the person of the Most Rev. M. Bruno of the Sorrowful Mother, OFM Conv., founder and religious superior of the Convent of St. John the Baptist. Prior to being offered the position of “Pastor,” the members performed their due-diligence by investigating Bishop Bruno’s religious credentials; which were confirmed as authentic and accurate; he passed a criminal background check, as required by the By-Laws & Constitutions of Holy Family. Bishop Bruno’s first acts as Pastor included making a Profession of Faith, as well as the Oath Against Modernism, both of which are renewed annually as required by the 1917 Code of Canon Law. The members of Holy Family regard Bishop Bruno as a validly and licitly ordained Priest and Bishop of the Roman Catholic Church1 who has faithfully served our congregation for the past 10 years and counting. Although there is already an inherent amount of jurisdiction that accompanies the title, office, and responsibilities of being Pastor, the trustees and membership of Holy Family formally requested to be under his Episcopal Protection and Jurisdiction. Bishop Bruno’s Apostolic Succession is derived from Bishop Patrick Taylor, who possesses valid and licit Roman Catholic Apostolic Succession through Archbishop Pierre Martin Ngo-Dinh Thuc of Vietnam, as well as additional sources. According to the late-Rev. Fr. Rama P. Coomaraswamy, M.D. (1929-2006), in his article “I’m The Only One Ordained!”, the Vatican II church and its popes have authenticated and fully recognize the validity of Bishop Patrick Taylor’s Apostolic Succession. 1 Patriarchal powers were conferred on Archbishop Peter Martin Ngo-Dinh Thuc by Pope Pius XI on March 15, 1938. These extraordinary pontifical faculties were renewed by Pope Pius XII on December 8, 1939, and were never rescinded. This power included, but was not limited to, the choice of priests to consecrate and to confer upon them the episcopacy without papal approval, and without any contingencies of future approval, acceptance, or ratification of those consecrations by future popes. 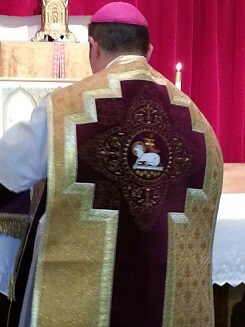 Therefore, the bishops directly consecrated by Archbishop Thuc, and those bishops, who in turn consecrated others, to our present day and in the future, possess both valid and licit Apostolic Succession, and are all validly and licitly ordained priests and/or bishops of the One, Holy, Catholic, and Apostolic Church. The validity and/or liceity of the Sacraments are not contingent upon the personal sanctity or worthiness of the priest or bishop conferring Sacraments.